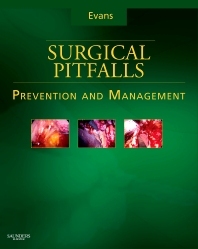 Offers in-depth guidance on the prevention, management, and consequences of complications and pitfalls that occur before, during, and after surgery—all in one convenient resource. Features a templated outline for specific procedures, allowing you to quickly review the associated pitfalls. Presents over 800 illustrations—including full-color intraoperative and postoperative photos—which enable you to follow the progression of a surgery and watch out for “problem areas,” while color line drawings help you visualize complex procedures.